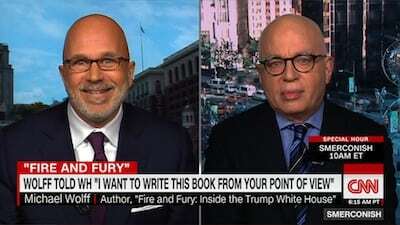 Saturday on CNN, I had the opportunity to interview Michael Wolff, the author of Fire and Fury, the hottest book in the nation, if not the world. Where that interview became the subject of great debate online and has been reported on by various media, I wish to provide some context and make a point that transcends Wolff and his best-seller. As I noted in Wolff’s television introduction, the book is already in its 11th printing, is in the No. 1 position at both the New York Times and Amazon best seller lists, and the publisher says it has orders for 1.4 million copies. Bloomberg has estimated that Wolff stands to make as much as $7.4 million on the book that the president and White House vehemently dispute but which has already cost Steve Bannon his job at Breitbart News. Interviewing Wolff presented me with challenges. First, I needed to get a copy of the book! I was lucky to spy an overnighted copy from Henry Holt in a tall snow bank outside my house where the UPS driver had chucked it. But when my mother expressed interest in reading it, I gave the book to her thinking I’d easily obtain my own copy via overnight mail from Amazon Prime. Instead I was told it might take 2-4 weeks. Luckily a CNN colleague gave me her copy. I should add here that I always endeavor to read the books of the authors I interview on SiriusXM radio and CNN. Very, very rarely do I host an author without reading their book. I often say that while I am known for speaking for a living, my job is actually to read, which I enjoy. (For years I have hosted book club events with best- selling authors like Nelson DeMille, Pete Hamill and Jane Leavy in the Philadelphia area with hundreds, sometimes thousands, of patrons.) I always chuckled when Larry King would say that he didn’t read his guests’ books because he wanted to be in the same position as his audience. How then, I wondered, would he know what to ask? Second, where many interviewed Wolff before me, most content areas had already been covered. I was initially to be among Wolff’s first interviews in a carefully planned rollout, but when the Guardian obtained a copy of Fire and Fury and printed excerpts, that schedule went out the window as the release was expedited. I asked a capable high school intern to provide me with links and transcripts to the more than one-dozen interviews that preceded mine. When I went back and re-read the answers Wolff had given those interviewers, one jumped out. At the end of his interview with Savannah Guthrie on The Today Show, he told Guthrie with regard to gaining White House access: “I said what was necessary to get the story.” What exactly that meant was not explained as the segment ran out of time, and I did not see that issue pursued to my satisfaction by anyone else. Given that the president was pushing back against Wolff via Twitter, I thought the subject had relevance. If the accuracy of a particular vignette was President Trump’s word vs. Wolff, then both of their credibility should be in play. In Wolff’s case, that would extend to how he gained access. So, I made efforts to find out how he positioned himself to the White House when first pitching the book as well as while writing it, and those efforts bore fruit. I thought that email was hard news and of great interest. By the time it was sent, Wolff’s work was well underway (he’d originally said the project was a look at just the first 100 days of the Trump Administration). The email suggests he’d still not had access to the president whom he was now offering to “humanize” where no one else was doing so, or had even shown interested in doing so. By June of 2017, according to Gallup, the president’s approval rating was at 39%, yet Wolff was still professing his “like” for the President while offering that he could change perceptions of the President – undoubtedly, but unsaid - he meant for the better. Was any of that true, I wondered? And wouldn’t readers like to hear his answer especially where the book does not contain many direct quotations? I thought so, and I decided to ask him. Not in a snarky, gotcha way. Anyone who listens to me on radio or television knows that is not what I do, probably to the detriment of my career. I’m all about having the conversation, not stifling civil discourse. Call me old fashioned, but there is meaning in my mind to the word “guest” for those who come on my program. They are my invitee, and I treat them with dignity and respect. Watch the complete interview for yourself, or read the transcript below. You will see that Wolff took umbrage at my questioning and accused me of doing the White House’s bidding to “discredit” him. No, Mr. Wolff, I was doing my viewers’ bidding. What separates me from the 1.4 million who’ve bought the book is that I’m among the few who have the opportunity to question you on behalf of those who do not. And if an appropriate line of inquiry did come from the White House, what am I supposed to do, ignore it because of the source? I can tell you one person who does not play by those rules: Michael Wolff, whose book, I should add, thoroughly entertained me as I tore through it in just two nights. ‪@smerconish‪ you are, like so many others like you, a slobbering disgusting #tRump supporter. Thanks for exposing Wolff as the lying POS he is…. Neither of these Tweeters is accurate. As I said at the end of my CNN program, radio and cable television viewers, indeed all Americans, have become so conditioned to think that opinions must be so doctrinaire that they literally don’t know how to react when someone presents nuance and that is what I was doing. Why is it so hard to understand that Wolff’s book both entertained me and raised questions of veracity? Sadly, today, if you do not line-up in some neat, albeit artificial, ideologically checked box, you are perceived as an outlier despite the fact that most Americans don’t fit those talk radio and cable caricatures. Watch and you will see that I earnestly welcomed Wolff to my program with an appropriate introduction, cordially gave him an opportunity to share something from the book that had escaped his many questioners, and then set about asking him about how he’d gained access. By the way, there was much more on my list of questions, including a few more White House emails I just didn’t have time to discuss. Stay tuned. MICHAEL SMERCONISH, CNN ANCHOR: Michael Wolff joins me now. Hey Michael I’m not sure what’s left to ask, you have been absolutely everywhere. Is there anything in the book that you thought would get more attention then it has thus far? MICHAEL WOLFF, AUTHOR: Well one of my favorite lines is when Trump calls H.R. McMaster a beer salesman. He say’s he looks like a beer salesman why do I have to talk to him? And I always liked line because I a have no idea what a beer salesman actually is. You know and that’s – there’s a kind of thing with Trump that it is as though he is from another generation. Two generations ago, three generations ago, there is something peculiarly trapped in time about him. And I think is part of the immigration debate that’s been going on since yesterday. I mean he really does, and in many situations I have found him talking about why aren’t – why do we limit immigration from Europe? Why do we have these other people? He say’s things like isn’t anyone an American anymore? It’s that kind of thing. So in odd thing is that Trump in the end is kind of like your old grandfather. SMERCONISH: I’ve tried to keep abreast of the many interviews that you’ve given in connection with the book release. Something that you said to Savannah Guthrie peaked my curiosity, roll the tape. SAVANNAH GUTHRIE, CO-ANCHOR THE TODAY SHOW: Your former editor at “Vanity Fair” Graydon Carter said he wasn’t surprised you’d written this explosive book. He was surprised they let you in the door at the White House. Are you surprised? WOLFF: You know, no I’m a nice guy I go in. SMERCONISH: Michael Wolff what did that mean? I said what ever was necessary to get the story. WOLFF: Well I don’t know, it’s a – I went in and I was – I did not say I you know I hate you and I’m opposed to you and good riddance to you, as much as the media has basically said. I went in and said actually what was, what I believed, which was show me what you’re doing. Tell me what you want to do. Let’s – let’s see how this, how this works. Let’s see if this can work. So I think that I projected to the White House an amount of honest openness frankly. SMERCONISH: Honest openness? Did you ever misrepresent your objective or your feelings about the President? WOLFF: Never, never once, never in anyway. I went into the White House and I told them I want to write this book from your point of view. I don’t want to be someone looking in. I want you to tell me what you think. And that’s really what the book is. The book is not my impressions of this White House or the President. It is in the voices of the people in the White House. SMERCONISH: Did you tell them that your objective was to humanize the President? That nobody was doing that. That you personally liked the President, that you’d be able to change perceptions about the President that you hoped to interview him in a relaxed state? WOLFF: I probably said yes that I wanted to humanize the President which I wanted to do. SMERCONISH: Well were all of those pledges accurate when you made them? Where they all honest? Do any of them embarrass you today? WOLFF: No, not in the least. As I said I, it sounds like you have something on your mind here. SMERCONISH: I do, I do. WOLFF: I – well I went into this White House saying I want to write it from your point of view. Tell me, I’m completely open to this. If I could write a book which – in which I found that the President was contrary to all opinions a potential success I would have been delighted to write that book. SMERCONISH: Is it fair that you presented yourself as sort of the beacon to combat media biased against the President? And that that was the way in which were seeing (inaudible)? WOLFF: You know I didn’t – I didn’t much present myself in any way. And nor did any one particularly inquire as to – as to my point of view or where I was going, or what this book was going to be. To be perfectly honest no body was that interested. I mean I asked the question because it sounds like you're presenting yourself as an individual who has his best interest at heart, likes him, wants to show a more humanizing side of him, and for that reason you should be given access. It becomes relevant because many of us who read the book, and I read the book, are trying to understand where the White House denies it well what's true and what's not true, and, therefore, your level of veracity in walking in the door becomes significant. WOLFF: And -- and I’m missing -- so what are you implying here? I mean that's the way -- that is exactly -- no. That's exactly what I had in mind to do. It was open your kimo, let me see. I’m willing to write – I’m willing to write any story here. Give me the story. I wrote the story what I got. I wrote what I saw, and what I heard. SMERCONISH: How much access did you have to the President? Were there any interviews at all for the book? HWOLFF: I have said from the beginning I have spent about three hours in one-on-one conversations with the President during the campaign, the transition, and in the White House. SMERCONISH: Okay, because from the paper trail that I’ve seen and I’ve tried to become more knowledgeable in anticipation of having you here, it doesn't seem like there was any interview you were afforded for the book per se. There is a Hollywood reporter interview that you did. WOLFF: I think we should, OK, I think that we should point out that I’m someone in the White House has obviously given you e-mails that I sent which is perfectly fine. But, you know, the White House has been on a concerted attack on me since this book came out. By the way, a totally incompetent attack which so far has found a few typos and turned this book into the best-selling book in the world. But you are now doing the job of the White House. Just so everybody knows that. SMERCONISH: I have questions. I have questions. SMERCONISH: I have questions as a reader. I have questions as a reader, and they are this. Go ahead. WOLFF: -- he says, so the implication is he was polite. SMERCONISH: Michael, I think, I think the questions, I’ve raised, I’ve raised two subjects thus far. I have more but I raised two subjects thus far that I think are legitimate areas of inquiry. Wait a minute. Let me finish. Then you'll get to respond. SMERCONISH: The first is, the first is, did you misrepresent yourself in an effort to gain access? And the e-mail trail that I have seen thus far I think raises that as a legitimate question. Hey, I like Donald Trump. Hey, I want to humanize Donald Trump. I’m the guy who can change perceptions. I’m the guy who can combat the liberal negative media bias about him, seems the way in which you represented yourself to get in the door. I think that is a legitimate area of inquiry. Let me finish. I promise you'll finish. WOLFF: I have liked Donald Trump. I was interested in humanizing him. I was -- I do set out to change perceptions which actually I might have succeed at. But, yes, go on. SMERCONISH: In other words, when you said I might be able to change perceptions of him, you meant, you meant to the negative? WOLFF: I was perfectly willing to change perceptions in a positive way. SMERCONISH: You are a far more successful, you are a far more successful writer than I will ever be. I know that when I write e-mails seeking interviews, my word choice is to say, I will treat the individual with dignity and respect. I never go so far as to say let me humanize, you know like the person, I’m the one who can change the perceptions. I just found it unusual. You get the final word. WOLFF: I – I -- this is -- read my book. That’s all I have. That is my final word. SMERCONISH: Okay, I did and I just think it begs interesting questions as to, on what grounds were you able to pull up that sofa in the West Wing. WOLFF: I thought you were – I thought you were just giving me the final word. WOLFF: Anyway. So now let me take the final word. WOLFF: It’s just the book. I have written the book. You either like it or you don’t like it. So far it quite seems that many, many, many, many people do like it and it speaks to them. Final word. Thank you very much. Good bye. SMERCONISH: Michael, wait a minute. I read it. WOLFF: Where is my final word? SMERCONISH: And, I enjoyed reading it. SMERCONISH: And, I read it and enjoyed it. Here’s my point, you can you do both. You can both enjoy reading the book and question some of the content. That’s my point. And I thank you. WOLFF: Yes. Please. And, so you got the final word.